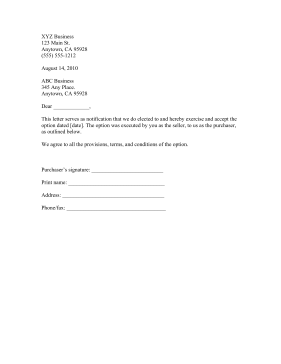 This letter, intended to be signed by the purchaser, serves as notification that the signer is exercising an option. This letter serves as notification that we do elect to and hereby exercise and accept the option dated [date]. The option was executed by you as the seller, to us as the purchaser, as outlined below. We agree to all the provisions, terms, and conditions of the option.